Hi everyone! It's time for a new challenge at Scrappy Moms Stamps. 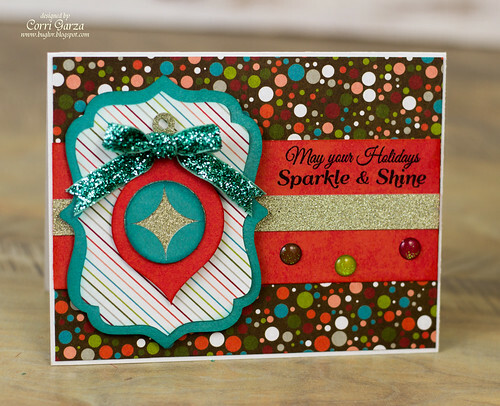 The theme is time is Merry an Bright...projects with glitter or other sparkle. I cut the ornament and bracket label with my Silhouette Cameo. This beautiful paper is from the Oh Deer Collection from Fancy Pants designs. I just love the turquoise in this collection. It really stands out. I added some glitter ribbon and some bits of gold glitter paper. Head on over to SMS, to play along for a chance to win. I'm linking this up to the current issue over at Paper Issues....Making it Merry! Link up for a chance to win a a scrapbooking kit from Gossamer Blue! Beautiful card. Perfect sentiment for this Merry & Bright challenge.